Allawi addresses Congress, thanks America. CNN's Aaron Brown on insurgents and kidnappers. For U.S. troops, strategy is simple: do their job, stay alive.  Hostage's brother accuses U.S.
WASHINGTON (CNN) -- President Bush on Thursday called for resolve in the fight against insurgents and terrorists striking the interim government and U.S. forces in Iraq. "And I believe that if we wilt or leave, America's security will be much worse off," Bush said, in a joint appearance with Iraqi interim Prime Minister Ayad Allawi before reporters in the White House Rose Garden. "I believe that if we fail in Iraq, it's the beginning of a long struggle," Bush said. "We will not have done our duty to our children and our grandchildren." He also said that "if we stop fighting the terrorists in Iraq, they would be free to plot and plan attacks elsewhere, in America and other free nations. To retreat now would betray our mission, our word and our friends." The president said "we're not going to abandon the Iraqi people. It's in our interests that we win this battle in the war on terror." Bush said he is "sickened" by the suicide bombings, beheadings and other methods used by insurgents to block Iraq's progress. He acknowledged that "terrorist violence may well escalate as the January elections draw near." The Rose Garden appearance followed an address Thursday morning by Allawi before a joint meeting of Congress. Allawi, laying out his government's security, economic, and political aspirations, told members of Congress elections for a transitional national assembly will be held in January, as scheduled. "Elections will occur in Iraq on time in January," Allawi promised. He mentioned the doubts many have expressed about Iraq's achievements over the months and said, "We will prove them wrong again." He said the insurgents and terrorists "will do all they can" to disrupt the elections. "There will be no greater blow" to the government's enemies than when the elections take place, he said. He acknowledged the balloting won't be perfect, pointing to early elections in other nations, but promised: "They will take place and they will be free and fair" and they will be "a giant step" in Iraq's "evolution." Allawi talked about progress in rebuilding the country and repeatedly took note of the contribution of Americans, the other members of the coalition and the United Nations. "We are succeeding in Iraq.... Thank you, America," he said. "We know Americans have made enormous sacrifices.... We promise you your sacrifices are not in vain." Allawi also expressed gratitude for the recent NATO decision to help train the Iraqi military. To energetic applause, Allawi said: "We are fighting for freedom and democracy, ours and yours. "Every day we grow in strength and determination to defeat the terrorists and their barbarism." He said the overwhelming majority of Iraqis are pleased that the Saddam Hussein regime was toppled, pointing to Saddam's killings and his gassing of Kurdish communities. Iraq continues to be plagued by a wave of abductions. In the most recent case, a British hostage, Kenneth Bigley, faces death at the hands of his Iraqi captors. Bigley and two Americans were abducted last Thursday from their Baghdad residence. The three men were in Iraq working on reconstruction projects. U.S. officials said the only women being held in Iraq are two "high-value detainees." Both are being held at Camp Cropper near the Baghdad airport, according to Iraqi sources. Gen. John Abizaid, head of U.S. Central Command, is raising the prospect that more troops will be needed to secure elections in January. Abizaid said Wednesday on Capitol Hill that those troops may not be U.S. personnel -- but he would not rule out that possibility. The United Nations has expressed concern about security for any personnel it might send to Iraq for the elections. 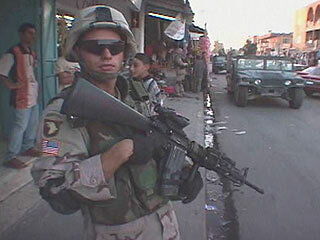 Presently there are about 100,000 trained and equipped Iraqi forces. 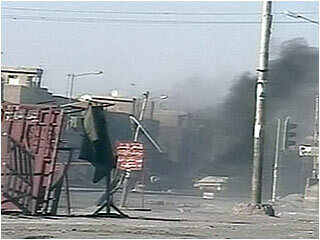 A car bomb attack in Baghdad on Wednesday killed at least 12 people and wounded 57 others, Iraqi police said. Iraqi and American personnel found a second car bomb in the area and detonated it. North of the capital, 14 insurgents were killed Wednesday in Samarra in clashes with U.S. troops, according to the Army's 1st Infantry Division. No injuries to U.S. troops were reported. Near Tikrit, an insurgent attack with an improvised explosive device killed an American soldier Wednesday, the military said. A Marine assigned to 1st Marine Expeditionary Force was killed in action Wednesday "while conducting security and stability operations" in Iraq's Al Anbar province, the Combined Press Information Center said Thursday. In another incident, Sana Toma, deputy-director of the Northern Oil Company, was killed Thursday morning in the Baladiyat neighborhood of Mosul, according to officials at Mosul General Hospital.